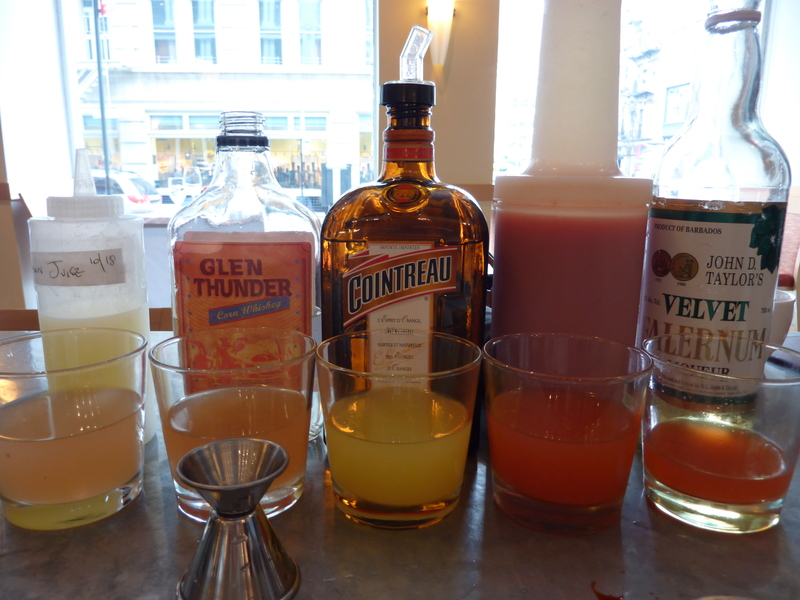 In preparation for USQ’s Autumn Cocktail Classic, I’ve been playing around with some cocktails featuring Glen Thunder. The Glen Thunder plays nicely with citrus, so I decided to use this as a jumping off point. I didn’t have orgeat (pronounced or-zat, from the Italian orzata, meaning almond), so I woke up this morning with the idea to substitute Velvet Falernum. Sweet, with almond and orange blossom notes, the Falernum also has some fall-friendly spices, like allspice and clove. From left to right: Take 1 - following the corn tassel recipe, subbing Velvet Falernum and Angostura: too tart. Take 2 - dialing back on citrus, adding dash of salt and adding a bit more Velvet Falernum: eh. Take 3 - same as take 2, subbing orange juice for lemon juice: getting there. Take 4 - same as take 3, subbing blood orange juice for regular orange juice: almost there. Take 5: same as take 4, dropping blood orange juice to 1 oz. and adding 0.25 oz. lemon juice: bingo. I combined all of these over ice, stirred and strained into a rocks glass. On Saturday, the delivery vehicle will be plastic. Sweet and citrusy, with the right amount of spice, here’s hoping it will help sell some booze! Did you know that there are an equal number if corn silks and corn kernels on an ear of corn? Corn silk can be dried and smoked. I am proud of you. Only you would wake up thinking of velvet falernum.